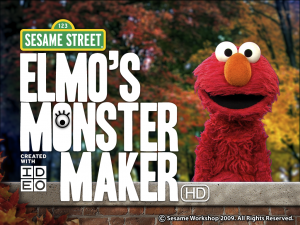 In Elmo’s Monster Maker HD, you join everyone’s favorite furry red friend Elmo as he introduces you to a cast of customized monsters. This app is as easy to play as tapping and swiping – no reading required. – Who doesn’t love Elmo?? If you have had a child in the last 30 years than you know Elmo, the Sesame Street resident that is the object of many a fond childhood memory. He’s quite the busy monster these days; aside from making appearances on the PBS show he’s also the star of many kid-centric apps available for download. He has tackled fun stuff like birthday parties and not-so-fun stuff like potty training, but Elmo always makes sure that your little one is having fun while learning. 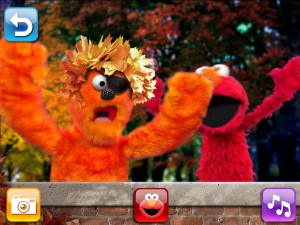 In Elmo’s Monster Maker HD, little fingers and tap and swipe their way through making choices and cultivating creativity. Kiddos choose from several furry and colorful monster bodies and add a face and zany accessories. They can then haveElmo capture their masterpiece as a photo in the iPad gallery to show off and share. The kooky monster voices and crazy sound effects made my 2-year-old giggle, and she just about fell off her chair when she realized that she could choose a slice of pie as a nose for a monster. My iPad gallery now has at least a dozen puppet portraits for her to scroll through and laugh at. She could also make the monster dance to any one of a number of funky songs. However, we were really disappointed in the complete lack of content, especially considering the fact that the price of this download is $3.99. All there is to do, really, is make monster faces, make them dance, and watch Elmo play photographer as the funny faces posed. The developers justify the price by adding seasonal updates such as a Thanksgiving pilgrim hat choice or candy corn nose option. Really there isn’t much that I can see that’s worth the chunk of change it takes to get this app. 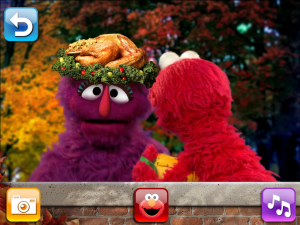 Elmo has a lot more than this app to offer – look around before you decide to download this. – All original Sesame Street video. 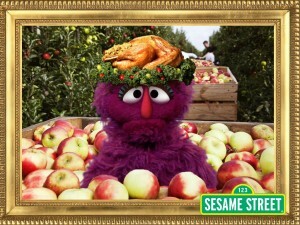 – Elmo’s photos of your monster go to your iPhone/iPod’s photo album. – Elmo interacts with your monster. – Your monster comes alive to dance and play. – Change your monster as many times as you like.